Candida albicans is a fungal organism, normally part of human upper aerodigestive tract flora. Candida albicans may become pathogenic (creating a disease state) when there is a disturbance in the balance of other normal organisms. Such an imbalance may occur due to use of steroids, either taken by mouth or inhaled, as for asthma. Other causes of candida albicans overgrowth include use of broad-spectrum antibiotics, and/or immunosuppression. The resulting disease state in the upper aerodigestive tract may cause hoarseness or an outbreak of thrush. An even more dramatic case of candidiasis, in a different patient. Here, the colonies are more obvious and nearly confluent. Countless candida colonies in the hypopharynx (lower throat) of a patient who, for treatment of an auto-immune disorder, is not only inhaling steroids but also taking high-dose steroids orally. Each tiny white dot represents a colony of the fungus. Candida colonies are routinely surrounded by a zone of erythema (see other photo series). No redness is seen here. After aggressive throat clearing, the pattern of white lesions has changed, and this is of course another indication that we are not dealing with candida colonies here, but simple adherent mucus. This man uses a steroid inhaler for his asthma. 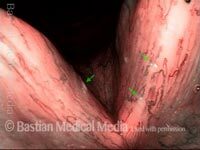 During esophagoscopy, white lesions were seen in the larynx and his GI Doctor sent him for evaluation of probable candida overgrowth. In all routine views, such as this one, white lesions are seen. This patient uses inhaled steroids and takes oral steroids as well. 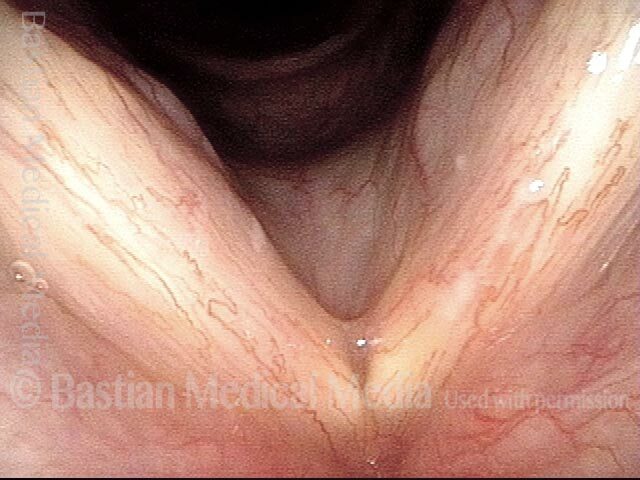 She has had prior episodes of documented Candida infection in prior years and has developed new laryngitis. Under standard light, both haziness (Candida) and redness (inflammatory response) are seen. Narrow band light shows the leukoplakia much more clearly. 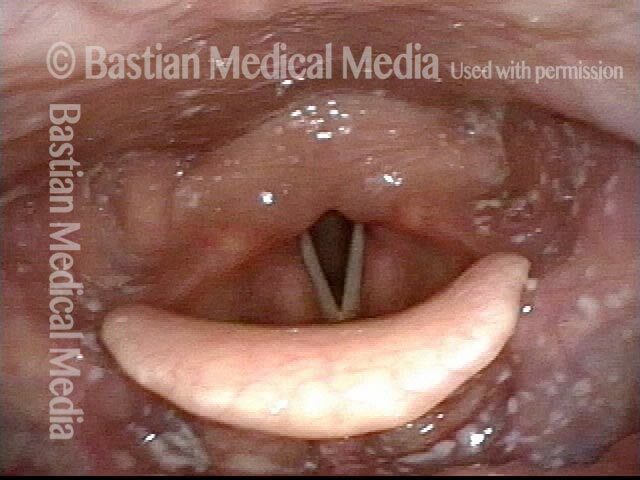 Candida on the vocal cords is often hazy and diffuse, presumably because the shearing effects of vibration do not allow the discrete, demarcated colonies often seen in other locations. This individual is also highly talkative, and also has a swelling of the left vocal cord (right of photo) from vibratory injury. The inflammation present here may have facilitated this injury.